NOTHING SAYS "I LOVE YOU" LIKE SALAMI | jeni a. 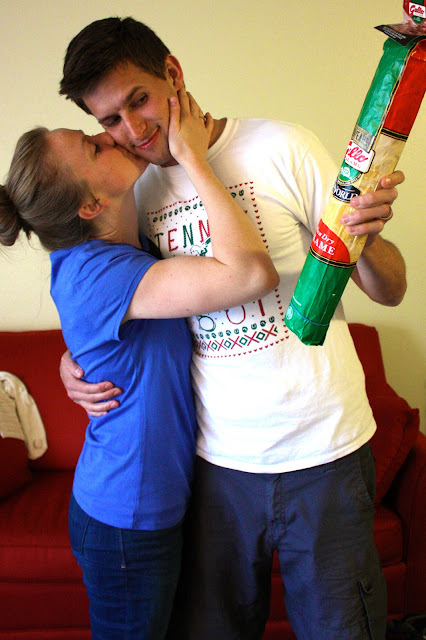 Yesterday my main man finished yet another semester of college, and to give him props I surprised him with a ginormous stick of salami (cheers, Costco). It was only a month ago that I learned that salami is Ryan's very favorite food. He says it's the Spaniard in him, and since, you know, I pretty much cook like an American around here, I never ever knew. So thank you, neighbors, for helping me find this out. They gave us the remainder of their huge salami stick before leaving for Italy, and if they hadn't, who knows how many more years would've passed before I learned how to further win my husband over. Seriously, though, Ryan deserved something he really enjoys at this semester's end (last semester I just gave him mac n' cheese - his close second fave). I teased him too much this time around for loving economics more than me. Plus he worked so hard and did so well. Yep. He needs that salami. Ryan rocks my world. His work ethic amazes me. It's taking him places no doubt, the first of which is right to the center of my heart. I love my man like he loves fine meats. He loves me like I love unconventional gifting. Thus he and I love each other a heck of whole lot.